The resolution, unlikely to pass without leadership support, accuses Rosenstein of seeking to block congressional oversight of Robert Mueller's investigation. WASHINGTON — Conservative Republican House members introduced articles of impeachment Wednesday evening against Deputy Attorney General Rod Rosenstein, accusing him of trying to stymie congressional oversight of special counsel Robert Mueller's investigation of alleged interference in the 2016 presidential campaign. A spokesperson for Meadows told NBC News on Wednesday night that the resolution isn't considered a "privileged" motion, meaning whether it eventually comes up for a floor vote is in the hands of the Republican leadership. The distinction is crucial, and the measure is unlikely to pass without the support of the House leadership. House Speaker Paul Ryan, R-Wis., said last week that Rosenstein should be allowed to finish his investigation. "Nothing's changed," Ryan said last week. Rep. Trey Gowdy of South Carolina, an influential figure among House Republicans who is chairman of the Oversight and Government Reform Committee, indicated on Wednesday that he was largely satisfied with the pace of compliance by the Justice Department. 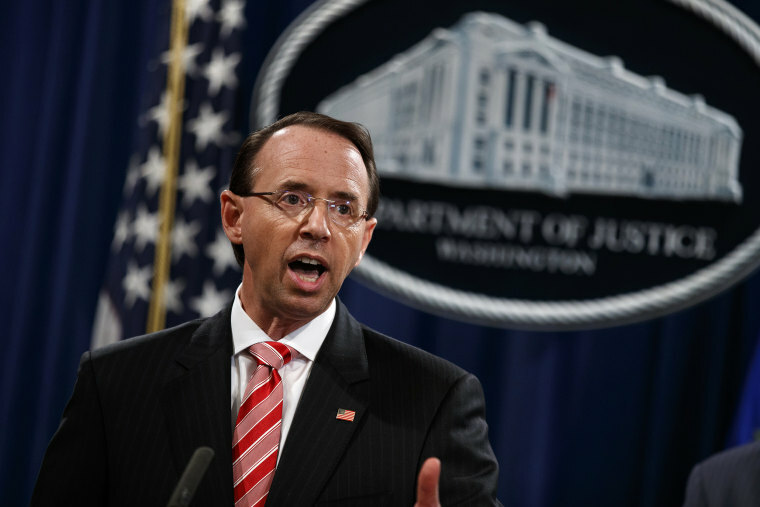 On Rosenstein's watch, the Justice Department has "made every effort to obstruct legitimate attempts of congressional oversight," Meadows said. "The stonewalling over this last year has been just as bad or worse than under the Obama administration." He added: "This level of conduct, paired with the failure to even feign an interest in transparency, is reprehensible. And whether you're a Republican or a Democrat, this kind of obstruction is wrong — period." Who is Carter Page, and what does he have to do with the Russia probe? A spokesperson said the Justice Department had no comment. In a summary of its compliance with requests from congressional committees, the Justice Department said early this month that it had responded to all requests from an initial subpoena from the House Intelligence Committee and had responded to most requests from a House Judiciary Committee subpoena. Rosenstein assumed supervision of Mueller's investigation when Attorney General Jeff Sessions recused himself in March 2017. The resolution was filed after House Republicans and Justice Department officials met late Wednesday afternoon to discuss outstanding requests for documents. Meadows told NBC News that Dana Boente, a former acting assistant attorney general who is now the FBI's general counsel, told the group that Peter Strzok, the senior FBI agent who oversaw the Clinton email investigation and helped lead the initial Russia probe, should have answered more questions than he did when he testified before a joint hearing of the House Oversight and Judiciary committees this month. Strzok was removed from the investigation last year after it emerged that he had exchanged anti-Trump text messages with Lisa Page, an FBI lawyer. In a statement Wednesday, Meadows and Jordan said "evidence continues to mount regarding the Department of Justice's problematic decision-making during the 2016 campaign and conduct surrounding the transition to President Trump's administration in 2017." "The failures cited within the articles include intentionally withholding embarrassing documents and information, knowingly hiding material investigative information from Congress, various abuses of the FISA process, and failure to comply with Congressional subpoenas, among others," it said. FISA, the Foreign Intelligence Surveillance Act of 1978, is the law under which a secret court reviews government investigations involving sensitive national security issues. In June 2017, Rosenstein signed an application to the court for a warrant to allow the FBI to conduct surveillance of Carter Page, who was briefly a foreign policy adviser to Trump's campaign. Supporters of the president argue that the warrant application improperly relied on the so-called Steele dossier, an opposition research document compiled in 2016 alleging a conspiracy between Russia and Trump's campaign. A heavily redacted version of the application released Saturday shows that authorities used other sources of information besides the disputed dossier. Democrats swiftly rose to Rosenstein's defense. "It is a panicked and dangerous attempt to undermine an ongoing criminal investigation in an effort to protect President Trump as the walls are closing in around him and his associates," the ranking Democrats on the Judiciary, Oversight and Intelligence committees said in a joint statement. Rep. Adam Schiff of California, the ranking Democrat on the Intelligence Committee, said separately on Twitter that the articles "were filed in bad faith and show [the] extraordinary lengths to which House Republicans will go to protect Trump." To impeach Rosenstein, the House would have to approve the articles by a simple majority and forward them to the Senate, which would conduct a trial. Conviction and removal from office would require a two-thirds vote in the Senate. The Senate has conducted impeachment proceedings 19 times in the nation's history, only once against a Cabinet member, when it acquitted Secretary of War William Belknap in 1876 of allegations of corruption. Overall, Senate proceedings have resulted in eight convictions, seven acquittals, three dismissals and one resignation. Rebecca Shabad, Mike Memoli and Alex Moe reported from Washington; Alex Johnson reported from Los Angeles.